The head of the world’s oldest bakery school will retire after training generations of bakers for over four decades. John Marchant joined the National Bakery School at London South Bank University (LSBU) in 1975 and was appointed Head of School in 1992. Under his leadership, the School has strengthened its impressive reputation for excellence within the baking industry. In recognition of his work, LSBU gave John the title of Professor Emeritus. The title is given to eligible retired members of staff to award their distinguished service and continuing association with the university. John’s passion for baking began at just 16 years old when he was offered the position of Apprentice Baker for Rank Hovis McDougall (RHM). Within four years, John was running the largest cake decorating department at RHM. By 24 he was the youngest production manager in the country. In 1975, John took a position as a full-time Lecturer at the National Bakery School. During John’s time at LSBU (formally known as Borough Polytechnic Institute), he received several high profile commissions. The work ranged from baking a cake for the Queen Mother’s 100th birthday, to creating cake sculptures for designer Jean Paul Gautier’s fashion exhibition in Paris and making a six tier cake for the 800th anniversary of the Magna Carta at the City of London. Another exciting commission came from artist Sharon Baker who requested bread baked in life-sized moulds of herself. The sculpture was presented to an audience at the art event ‘Eat Me’ which formed part of the annual London Thames Festival. John was promoted to Head of the National Bakery School in 1992. Under his leadership the School developed the Baking Technology degree, the first degree of its kind in the UK. After receiving his Masters in Education from LSBU in 1993, John went on to complete his PhD on the history of baking technology. John’s research was turned into a book entitled ‘Bread: A Slice of History’. The book was instantly a hit with the baking industry and went on to release three editions. 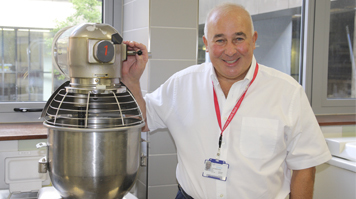 In 2013 John helped secure a £2.5m investment to redevelop the National Bakery School’s facilities. The funding was used to create specialist teaching spaces for baking, confectionery and chocolate as well as a demonstration bakery suitable for public presentations. Looking back on his time at LSBU, John said: “LSBU is such an exciting place in which to work. The tireless dedication that the staff in the School have in ensuring the students are always at the heart is something that I will tremendously miss. "We are now offering degrees in baking that are harnessing cutting-edge science and developing new talent for a growing industry. Now that the redevelopment of the School has been completed, I feel that now the time is right to hand over to others who can continue LSBU's historic link with the baking industry. “For the last four decades my job has been all about education and preparing students for the industry and it has been an absolute privilege and joy."